Welcome to the Crazy Crafters Blog Hop with our Special Guest stamper, Brian King - we are thrilled to have Brian join us this month and so excited to CASE (Copy And Selectively Edit) any project that has been created by him. We hope you find great inspiration from the projects. This is the card by Brian that I have chosen to CASE. The layering really appeals to me and I like the simplicity of the colour scheme. 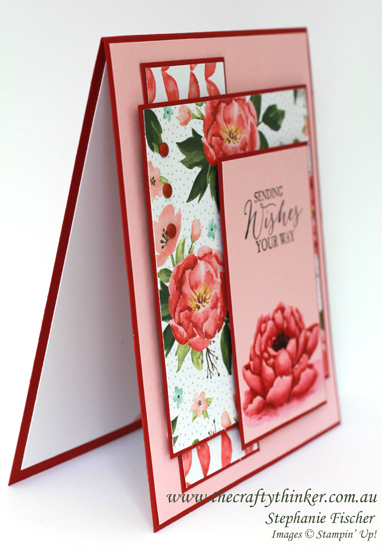 I decided to make my card and mats for the layers in Cherry Cobbler cardstock. I cut a 12" square piece of Cherry Cobbler to 6" x 5.25" and folded it in half. Then I cut a Blushing Bride layer 1/8" smaller. I decided on the sizes for the rest of the layers by first trimming the flower to as narrow a strip as possible and then creating balanced layers from that measurement. All the mats are 1/8" larger than the patterned pieces. 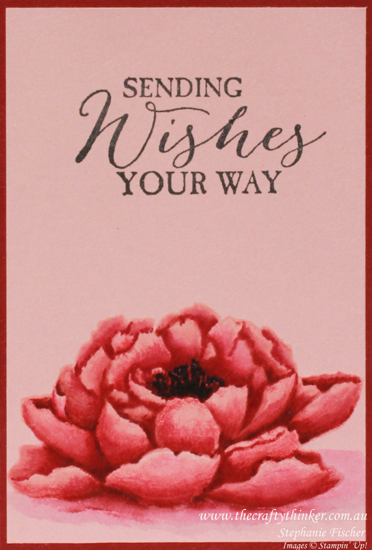 Once I'd trimmed the painted flower layer to size, I added a greeting from Butterfly Basics, stamped with Basic Black ink. 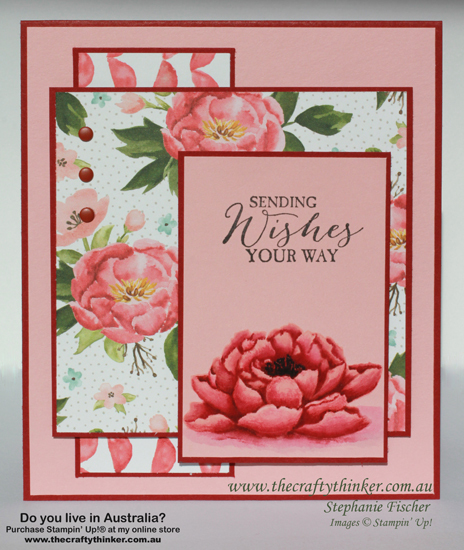 Brian took a lot of trouble to stamp the middle layer of his card but I decided to take the opportunity to use some beautiful Designer Series Paper and chose a couple of patterns from the Birthday Bouquet DSP. The candy dots I used are Cherry Cobbler from the Regals set. Knowing that Brian is fond of dimension, I used LOTS of dimensionals to adhere the layers to the card! Lots of dimensionals to honour Brian! Bottom layer: Mat 2" x 53/8" DSP 17/8" x 51/4"
Middle layer: Mat 41/2"x 43/8" DSP 43/8x 41/4"
To purchase from my online store, click on one of the product images below.